Pet grooming is just as important as it is for humans. To keep a dog healthy, it must regularly be groomed, and there is no better way than to use the best dog combs in the market. In addition to washing and drying, your dog’s coat requires a careful combing. Each dog’s hair is different from the other just like it is with us, humans. Even though the market is flush with dog combs, you must be careful when picking one for your dog. You should consider your dog’s hair length, thickness, and the comb material. Here is a selection of dog combs to start you off. 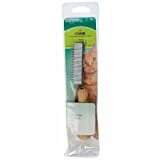 This de-matting comb from Safari is excellent at removing tangles and mats from your dog’s coat. 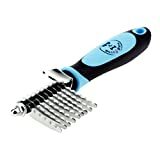 Its stainless steel blades feature serrations that efficiently comb out most dog hair tangles.This comb can be used on a majority of medium to long-haired dogs and is good for the coarse or long coats. Using this comb, you can give your pet a healthier, shiny coat. It removes knots, tangles, mats, and shedding, making it the perfect tool for grooming pets with thick, long and matted coats. This comb does not pull out the pet’s hair; the stainless steel blades have smooth rounded edges so your pet won’t get hurt during grooming. It is ergonomically comfortable on your hand, and the anti-slip rubber ensures it stays in place and causes no hand fatigue. It is made of high-quality material, making it very durable. 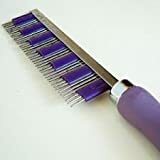 Use this comb to efficiently remove any loose hair and dust while stimulating the dog’s skin to produce oil to keep the coat healthy naturally. 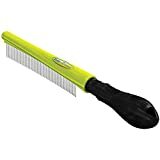 This comb is designed to comfortably fit into your hand when grooming and is recommended for short to medium length coated pets. 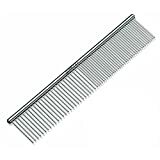 Get this round edged pet comb for comfortable and complete grooming. It is gentle on the dog and recommended for pets with single or double coats. It leaves the pet feeling happy and with a healthy, shiny coat. The teeth have different spacing making it effective at de-matting and riding the hair of fleas. This comb does not cause any allergic reactions or irritations on the dog. This Safari shedding comb features a contoured wooden handle and is designed to reduce shedding in both short and longhaired cats. The smooth rounded edges ensure comfort for the pet when combing. It has long teeth that penetrate deep into the fur, therefore, lifting the loose hair. It efficiently collects the released hair, leaving your cat with a clean and soft coat. Using this comb, you can remove tangled, loose and shed hair with ease from your pet’s coat. It is recommended for dogs and cats of all sizes and hair types. The round teeth prevent scratching your pet’s skin and are good at massaging them as you comb. It ensures your pet looks good and feel great. It is made with durable material and designed ergonomically for comfort when using it. This comb is designed to de-fur even the lightest skin like that of a rabbit. Their smooth rounded edges ensure the skin is kept safe and the fur-catching band traps all the loose fur even on heavy shedders. This is a social activity that your pet will enjoy as much as it is to keep its coat healthy. The FURminator efficiently removes mats on small surfaces and keeps your pet tangle and debris free. The rounded pins rotate therefore eliminating any skin irritation while minimizing tugging. The comb follows the pet’s natural contours for a comfortable combing session. This comb features rotating pins to ensure a gentle combing to untangle the dog’s coat. The medium comb has a single row of teeth whereas the shedding comb features two teeth levels for efficiency. The stainless steel smooth rotating teeth pull through the coat easily and comfortably. Use the durable cat grooming kit made of high-impact plastic. It easily attaches to the corner or wall and is simple to remove for cleaning purposes. It is comfortable to the cat as it appeals to its natural rubbing instincts. Purchasing the wrong comb will cost you money while inflicting pain on your dog when combing. It is crucial that you purchase Best Dog Combs to work for your dog comfortably. With the right comb, you will enjoy the process of grooming your dog even if you didn’t like it before. As long as you have identified the right comb for your dog, the rest is easy.